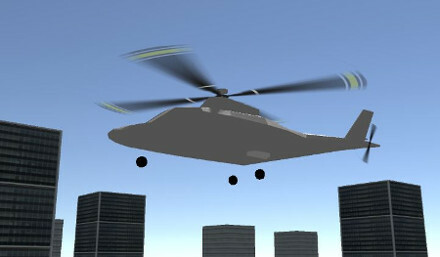 This is a helicopter simulation toolkit for the Unity3D game engine. The idea is to bring the dynamics model HeliSharp into Unity, and also use the Unity Editor for parametrization and visualization of model parameters. The author is also working on a more feature-rich demo which will be provided as a downloadable executable, as it will be built using proprietary components from the Unity Asset Store and elsewhere. Be aware that this project is in an early stage of development. You need Unity3D. Version 2018.2.4 (Windows and Linux) was last tested. Clone or download the project, open it up in Unity, open the example scene and hit run. You won’t be able to try it out much unless you have a joystick or gamepad. Unless you’re using an Xbox controller you will need to remap your joystick inputs in the Edit / Project Settings / Input menu. UnityHeliKit is an open source project. If you intend to use it for any purpose, personal or commercial, please contact the author. I’d love to know what you make out of it. If you have simulation or game development experience and would like to contribute, please feel free to submit issues and/or pull requests, and contact me. This project is licensed under the Apache License 2.0 - see the LICENSE file for details.